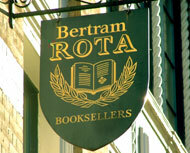 In 1923, just before his twentieth birthday, Bertram Rota started bookselling on the Charing Cross Road. From 1918 he had apprenticed to his uncles Percy and Arthur Dobell, in their father Bertram Dobell’s bookshop which dated back to 1876. From the outset, he specialised in Modern First Editions, a field that he virtually invented and subsequently made his own. Indeed, the Oxford English Dictionary gives a Bertram Rota catalogue (158) as a source for one meaning of the word ’modern’. Twenty three catalogues were issued from Davies Street (1927-1934) and a further seventeen from Old Burlington Street until in 1937 he moved into a premises in Vigo Street, formerly the offices of John Lane. This address was where, at the sign of the Bodley Head, the Yellow Book and many other 1890s classics had first appeared, and whence the first Penguin metaphorically took flight in 1935. In spite of sustaining a direct hit during the blitz, this bookshop was to be home for the next twenty-eight years. There Anthony Rota joined his father, at a time when links with North American universities and institutions were being forged. 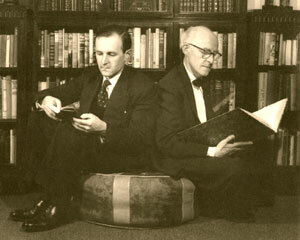 Soon, larger premises were required and found a mere forty yards away at 4,5 & 6 Savile Row. 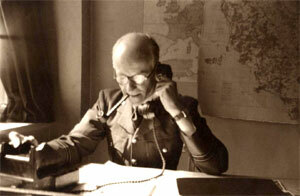 Sadly, Bertram Rota died suddenly in 1966. In 1977, with Anthony at the helm, the next move was to Covent Garden. The firm purchased a handsome listed building in Long Acre, creating what was often referred to as ‘the most beautiful bookshop in London.’ This was no small feat: the building had been a banana warehouse, and its basement was full of fossilised Christmas trees. This building was built in 1860 in the Venetian style, and housed a coach and harness manufacturers. The striking facade of pink stone is punctuated with barley-twist detailing; the ornate window frames are painted Covent Garden green. In 1995 Julian Rota followed his father into the business and is now managing director. He was recently joined by his wife Dorothea who specialises in books and archives on architecture and the applied arts. The business continues to number amongst its customers many national libraries, august universities and other institutions. In his otherwise highly enjoyable epistolary memoirs, Among Booksellers, David Batterham (a fellow bookseller and friend of the firm and the family) writes about the tricks that memory can play. In doing so he inadvertently implies that Anthony Rota was in some way "involved" with a Corvo forgery. David has apologised and confirms that this involvement amounted to no more than having been sent and returning a copy of the book in question and engaging in correspondence about it.